This trendy cropped hoodie is one of a kind. It's raw edge and matching drawstrings make it fashion forward while the super soft material keeps it casual and comfortable. This crop top sweatshirt is perfect for just about any occasion. Wear it while you workout, lounge around the house, and even out on the town. Make your workouts even more fun by customizing a fitness hoodie. 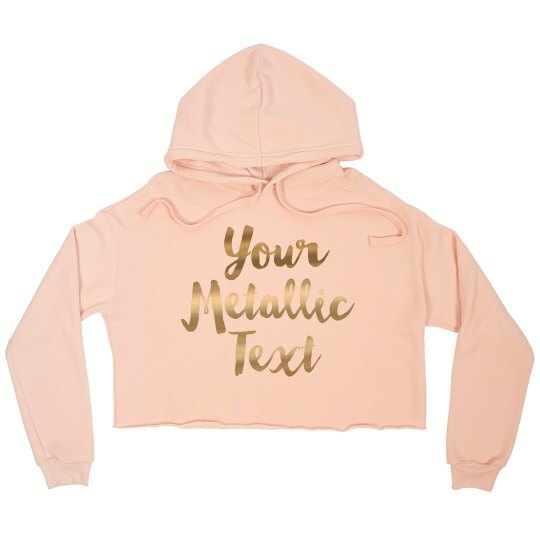 Add your personal style by customizing one in our easy-to-use design center by adding a custom text and style it up with our metallic font finish for that glow up look so that you stay looking cute at the gym.